Have you ever asked yourself how much time you spend on average in front of your computer? Sure, you can probably estimate the time, but that would not probably be as accurate as it could be. 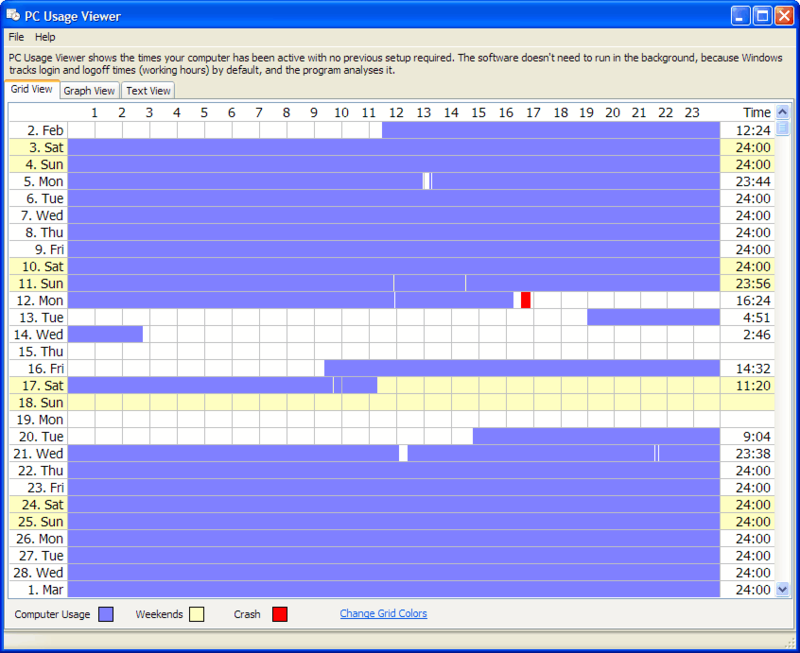 The free software program Pointstone PC Usage Viewer displays the times the computer has been active. The application requires no background process or initial setup before it can display the PC activity. This is achieved by pulling the information directly from the Windows Event Log. The Windows Event Log records PC startup and shutdown times, all PC Usage Viewer does is to take the data from the Event Log to calculate the time the computer was turned on. It is important to note that a turned on computer does not necessarily mean that a user has been actively using it, at least not all the time. 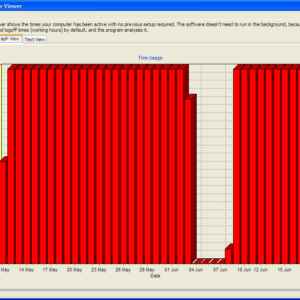 The program displays the date, and the uptime on that date as a bar, and as hours and minutes. 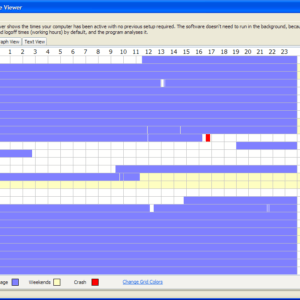 Blue indicates computer activity, while blank space indicates that the computer was turned off at that time. Weekends are indicated with a light yellow coloring, and crashes with red. The total hours and daily average are shown at the bottom of the screen. Tabs at the top can be used to switch from grid view to graph or text view. Both do however display the same information. 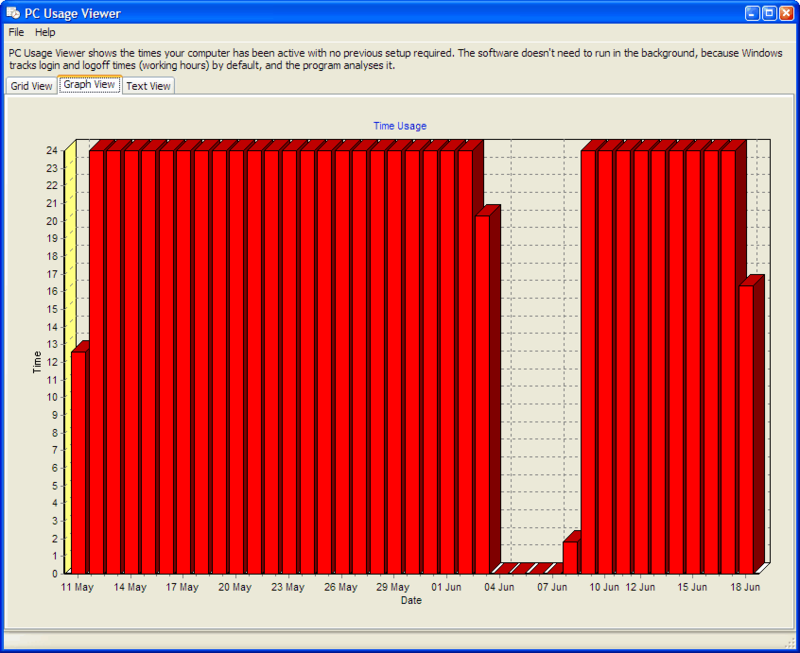 PC Usage Viewer offers statistics about a PC's activity. The program is not something that one would run constantly, but it does have its uses. It can for instance be used to check if a computer has been active at a specific time, for instance to see if the kids, friends or coworkers used the computer. The software is compatible with all Microsoft operating systems from Windows XP to Windows 7. The program is supplied as an installer, it is possible to extract the installer and run the PCUsageViewer.exe from the extracted folder directly. I have the nagging feeling that I have reviewed that application before, but I searched for it and could not find it.. Interesting idea, though it doesn’t seem able to take idle time, or standby time, into account; just login/logoff. There is a free and a paid version; however the free version does its work just fine.